Syrian boys look at the destroyed grills outside a shuttered restaurant that was the site of a suicide attack targeting U.S.-led coalition forces in Manbij, Syria, the previous day, on Jan. 17, 2019. Islamic State claimed responsibility for the attack. 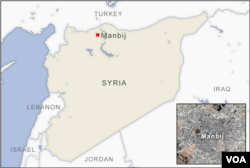 With a single deadly blast Wednesday, the Islamic State group did more than rattle the calm in the northern Syrian town of Manbij. 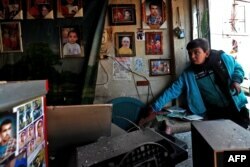 The terror group also rekindled the debate over its much-heralded demise. Moments after a suicide bomber was sent into a patrol of U.S. troops and their Syrian counterparts, four Americans and five U.S.-backed fighters lay dead or dying, while images of bodies and blood-splattered walls were being shared across social media, finding their way into news articles and broadcasts. But to officials and analysts who have been studying the collapse of the self-declared caliphate, the attack, while brutal, likely was not shocking. "ISIS maintains the capacity to pursue opportunistic attacks and present itself as an enduring security challenge in Syria," said Nicholas Glavin, formerly a researcher at the U.S. Naval War College's Center on Irregular Warfare and Armed Groups, using an acronym for the terror group. For more than a year, U.S. intelligence and defense officials have warned publicly that IS was finding ways to adapt to its mounting losses, sustaining enough manpower and resources to do damage. In Iraq, where the caliphate had collapsed, IS cells carried out attacks on critical infrastructure, targeting water supplies, power lines and cell towers. Local officials said other cells carried out campaigns of assassinations and kidnappings. "They have deep, in some cases, familial links," Christopher Maier, the director of the Defense Department's Defeat ISIS Core Task Force, told VOA. "It's going to be fundamentally, I think, hard to see what these threats look like until they manifest." U.S. officials have yet to confirm Wednesday's deadly attack in Manbij was indeed the work of IS, though they believe it likely was. Syrians check the site of a suicide attack targeting U.S.-led coalition forces the day before in Manbij, Syria, Jan. 17, 2019. Yet they worry that the way in which it was carried out and the way in which IS moved to capitalize on it could be a sign the group's network of family, friends and sympathizers are well-placed for a long fight in Syria as well. For example, despite having been kicked out of Manbij in 2016, IS knew when and where to strike, targeting the patrol near the restaurant where U.S. troops were known to stop to meet with their coalition counterparts. "There's a good chance the group had spotters engaged in surveillance in the immediate vicinity who informed Islamic State's local intelligence and security officials in real time to dispatch the suicide bomber," said Jade Parker, a former counterterrorism analyst in support of U.S. military activities. "If this is the case, it appears as though the Islamic State intelligence and security services have not been as thoroughly degraded as some have claimed," Parker added. The ability of IS to quickly claim responsibility, sharing details such as the name of the suicide bomber and the U.S.-backed coalition's immediate response, also indicates its propaganda machine is still dangerous. "Propaganda-wise, ISIS remains extremely intact," said Raphael Gluck, co-founder of Jihadoscope, a company that monitors online activity by Islamist extremists. "They may not be releasing the amount of videos they once were, and perhaps content might not be lingering on social media as it used to, but a very steady flow of Islamic State media remains," Gluck said. An image grab taken from AFP-TV on Jan. 17, 2019, shows Russian army vehicles on patrol in the area of Arimah, just west of Manbij, Syria, where a day earlier a suicide attack on a restaurant killed four U.S personnel. It is those types of indications of the Islamic State's resiliency that have long worried defense and intelligence officials, who have repeatedly argued that no one should confuse the collapse of the terror group's caliphate with its lasting defeat. "We're under no illusion that we're dealing with a long-term challenge," Gen. Joseph Dunford, chairman of the U.S. Joint Chiefs of Staff, said during a conference on defeating IS in October. "We know from previous experience that when you relieve pressure on the threat, they will take the ability to reconstitute."